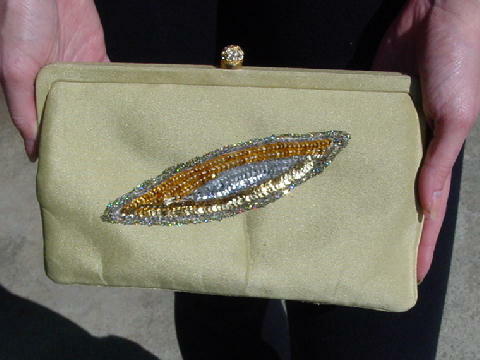 This vintage sunkissed gold-tone light olive fabric clutch has a gold-tone dome top closure (which looks like a crown) that is covered in rhinestones. It has a beautiful beige satin lining with two interior open pockets. Eden attached appliques of silver and gold sequins, silver beads, and white pearls in the shape of a 3-leafed flower with a paisley shaped stem. She outlined the flower with a gold-based multicolor glitter. 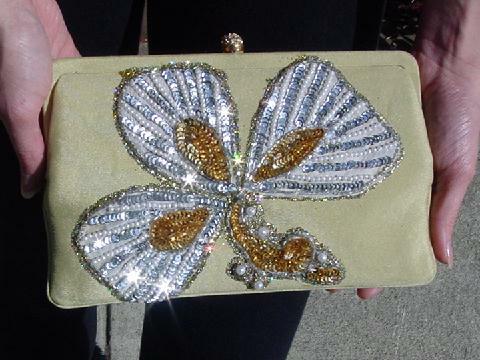 The design runs diagonally across the front of the purse, covering approximately 8" across and 5 1/2" high. On the other side of the purse is an oval shaped applique with triangular corners running diagonally (6 1/2" wide by 1 1/2" high) across the back of the purse, again outlined in a gold-based multicolored glitter. The applique consists of silver beads and gold and silver sequins. This is a completely unique, one-of-a-kind design, very elaborate and extremely striking. 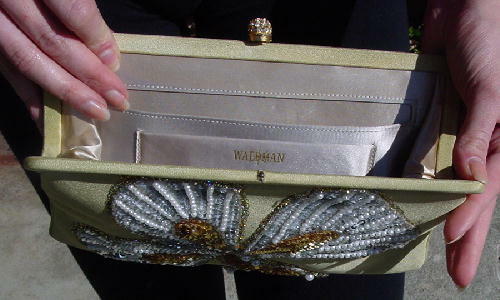 The purse can be carried by either top corner in either hand, so as not to interfere with the artwork. It's one of Eden's favorites, and an exquisite bag.